Terrington St Clement tower mill at Orange Farm, South Green on the Sutton Road was built c.1816 with 5 sails and was still running with all 5 in 1854. Later, the tower was raised two storeys to 65 feet and uprated to run with 6 sails, each with 7 bays of 3 shutters, thus becoming one of only six mills in Norfolk to possess 6 sails. The horizontally boarded ogee cap had a petticoat, gallery, was atopped by a ball finial and held a 6 bladed fan. The six double shuttered sails drove 3 pairs of stones - 1 pair of 4 ft. French burr stones, 1 pair of 3 ft. 6 ins. French burr stones and 1 pair of 4 ft. Peak stones. A boulter for flour dressing and an oat crusher were also in use. All the stones were overdriven and the tower had a stage set around the 2nd floor. The other known six sail mills in Norfolk were at: Sculthorpe, Ringstead, Terrington_St_Clement_Balsam_Fields, Walsoken West Walton Highway and West Walton Ingleborough. near the west end of the village, is now the residence and property of Mr. Wm. Whisler. It belonged to the late Lord William Bentinck, who purchased the estate in 1816, of Baron Feagle, a German refugee, who entertained the Prince of Orange here when the French had invaded Holland, from which circumstances the house obtianed its present name. The wind-mill, which stands near the house, was erected by the Baron, after the German fashion. Brick Tower Mill, oroginally five sails, then raised 2 storeys and fitted with six sails. Date (not known definitely by writer) 1713? Built by Baron Feigle (a Dutchman) it is recorded that he entertained William of Orange at the adjacent Mill House, hence the name Orange Farm. The Mill ceased working in 1910, and trhe tower was finally demolished in the 1920s. The brick structure was 65' 0" high. The cap was of the ogee type (typical of Lincolnshire near by), cross boarded, with gallery around and petticoat. Fan tail gear, with a six flyer fan. The sails were double sided, patent sided, the whips were 30' 0" long, and the diameter tip to tip about 62' 0". The shades being wood, backed with iron frame and covered with canvas. The windshaft was cast iron and the brake wheel, wood with iron gear segments, the 'Wallower' was also iron. The curb was cast iron with rack on the outer top, with pinion driven from the fan gear. The walls were 3' 0" thick at the bottom, reducing to 13½" at the top. The bottom stage was at 3rd floor level, all timber construction. There were 3 pairs of stones on the 2nd floor, 2 pairs being 4' 0" dia. and 1 pair 3' 6" dia. one large pair beiong Derbyshire peaks, the others French burrs. The stones were over driven by stone nuts, and the cases were octagonal in timber. One boulter for flour dressing. The two storied steam mill attached contained 2 pairs of 3' 6" dia. peak stones on a hurst erected by the well known millwright, Gothard Kidd, of Wisbech, Cambridgeshire. It wa soriginally powered by a steam engine, and latterly by an oil engine. Robert Fordham up to the date it ceased to operate. William VI Prince of Orange, Stadholder of Republic of United Provinces. In January 1795 the French Revolutionaries who had declared war on the Stadholder in 1795 invaded the Republic. When Napoleon was defeated at Leipzig October 1813 Prince of Orange returned from exile as King William I of the Netherlands. Lord William Cavendish Bentinck, 1774-1838, second son of third Duke of Portland, soldier, Governor-General of India, home in Britain, unemployed, 1815 to 1828. He bought Orange Farm in 1816 from Baron Fagel (Faegel, Feagle, Feigle) a Netherlands refugee who had entertained the Prince of Orange there. Mill built by Baron Fagel "after the German (Dutch?) fashion". Even if Baron Fagel was 100 then he could not have built the mill in 1713! Freehold Cottage Ornee and a most desirable Farm at Terrington, Norfolk ORANGE FARM with an elegant Cottage Ornee and very superior agricultural buildings of every description in excellent repair, constructed upon the most approves and substantial manner, with a valuable corn mill and threshing mill; another convenient dwelling house and six cottages, together with about 190 acres of remarkably rich arable land in the highest state of cultivation, having been in the occupation of the proprietor who has spared no expence to render the same complete. This property is most eligibly situate at Terrington in the county of Norfolk, about four miles from Lynn and ten from Wisbeach and is particularly adapted for any gentleman desirous of becoming an agriculturalist or extremely eligible as an investment. Printed particulars may be had at the Rose & Crown, Wisbeach, Dukes Head, Lynn, Sun, Cambridge, Auction Mart and of Messrs. Driver, Surveyors & Land Agents at their Offices, No. 13, New Bridge Street, Blackfriars, London, where a plan of the Estate may be seen. ORANGE FARM with an elegant Cottage Ornee and very superior agricultural buildings of every description in excellent repair, constructed upon the most approves and substantial manner, with a valuable corn mill and threshing mill; another convenient dwelling house and six cottages, together with about 190 acres of remarkably rich arable land in the highest state of cultivation, having been in the occupation of the proprietor who has spared no expence to render the same complete. This property is most eligibly situate at Terrington in the county of Norfolk, about four miles from Lynn and ten from Wisbeach and is particularly adapted for any gentleman desirous of becoming an agriculturalist or extremely eligible as an investment. A SINGLE MAN as MILLER who can strongly recommended from his late employer. Apply personally to Mr. Whisler, Terrington St. Clement, near Lynn, Norfolk. 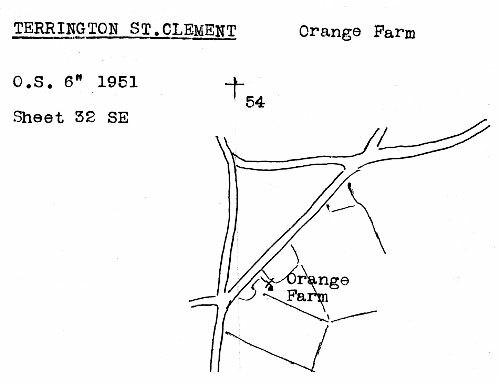 TERRINGTON ST. CLEMENT Orange Farm. Villa residence etc. 186a. 2r. 34p. Also a small farm house with stable adjoining, excellent Farm Buildings, FIVE SAIL MILL and cottages for labourers. With possession ath Michaelmas next. To be sold by Auction by Mumford & Casebow. Tuesday 30 May 1854 at Globe Inn, Kings Lynn at 4 o'c. in 13 lots. This very desirable estate called the Orange Farm with genteel Villa Residence was formerly the property of the late Lord William Bentinck and was purchased in 1816 of Baron Feagle a German refugee, who entertained the Prince of Orange here when the French had invaded Holland, from which circumstances the house obtained its present name. The wind-mill, which stands near the house, was erected by the Baron, after the German fashion. or the Auctioneer, Downham Market. WANTED immediately, a steady active Single MAN, one with a knowledge of the Baking preferred. A reference to character required. Apply D. Clifton, Terrington, Lynn. WANTED, a Steady Single Man of good character. A knowledge of the baking required. WANTED, a YOUNG MAN of good Character as ASSISTANT in the above business. WANTED immediately, a steady active Man to work a WINDMILL. One with a knowledge of the baking preferred. Wanted, a Miller and Baker immediately, Married man with no encumbrance and must well understand his business. Apply to Walker, Miller, Terrington. Wanted, a steady respectable man in the above capacity. Apply personally on Tuesday next at Dawson's Livery Stables, Lynn, between the hours of 5 and 6 by letter directed to Orange Farm, Terrington. Apply Jas. Walker, jun. Kenwick Hall, Tilney All Saints. WANTED, a man to work a brick tower wind mill; must be a good stone man and good character required. Apply to Arthur Walker, Terrington Mills. 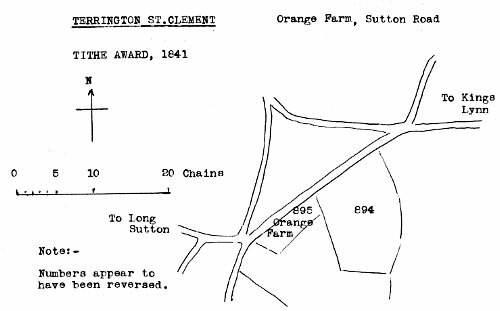 With possession at Michaelmas next, the Orange Farm, containing 83 acres or thereabouts, now in the occupation of Mr. Harry Colliver. On the Farm is an excellent Residence, suitable farm buildings, labourer's cottage and a six-sail flour mill, to which a ten-horse power steam engine is attached. It is situated oin the main road to Lynn, Wisbech and Sutton Bridge and is 6 miles from the Market Town of Kings Lynn and 1 mile from Terrington Railway Station. The land is for the most part suitable for fruit growing. For permission to view and for further particulars apply to Mr. George Cockle, Hay Green, Terrington, Kings Lynn. The fan on the mill occupied by Mr. R. Fordham was blown completely away, whilst the fan and sails on Mr. C. Peek's Mill also suffered. ... at Terrington there is a lofty conical brick tower mill, with rotating cupola and fantail, standing sixty feet high, built in the Dutch style. ... Terrington ... a conical brick tower some sixty feet high such as you may see by the wayside between Deflt and The Hague. ... the big windmill was built in the ... Dutch style; and the neighbouring farm is still known a Orange Farm, from the Prince of Orange having been entertained there while Holland was in the hands of the French.